Here's a free abs workout that uses the Swiss Ball. 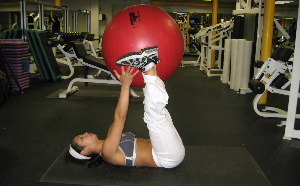 If you don't have a swiss ball (exercise ball), you can try another free workout from this site. You can perform this workout 2 ways. You can do 2-3 sets of the first exercise and then move on the next exercise. Or you can do them in circuit fashion moving from one to the next with little to no rest. Below are the abs exercises. You can click on the pictures to get a more detailed description of how to perform the exercise. Place your feet on top of the ball whil your body is in the push up position. Lift your hips towards the ceiling and move your body into the piqued position. Keeping your abs tight, slowly lower to the starting position. Begin by placing your elbows on the swiss ball. Keep your feet about hip width apart. Keep your abs pulled in and your back in good alignment. Begin by lying on your back with the ball between your feet and arms overhead. Bring your arms up to meet your feet and exchange the ball from your hands to your feet. Remember, you can perform this ab workout routine in 2 ways. Straight Sets: You can focus on 1 exercise at a time. After each set rest 30-60 seconds. Perform each exercise 2-3 times before moving on to the next exercise. Circuit Style: This is the most challenging technique because you would perform all 3 exercises in a row with no rest in between exercises. After you finish the 3rd exercise you can rest 60-90 seconds before repeating the circuit from the beginning. Perform the entire circuit 2-3 times. Hope you have fun with this free workout routine with the swiss ball. If you don't have access to a Swiss Ball, you can use any 3 abs exercises you like to create your own ab workout routine. Visit the Directory of Abdominal Exercises to learn all the ab exercises on this site.